Aiming to cover the best sites of Turkey, especially for first-time visitors and for those who wish to move on comfortably, Golden Triangle tour is an ideal itinerary of highlights on ancient heritages, nature, and history. Staying in luxurious and unusual hotels in Turkey and explore diverse locations and cultures including fascinating Istanbul on two continents, moonscape-like Cappadocia with cave dwellings and underground cities where early Christians survived and one of the most impressive ruins of the world in Ephesus being excavated over 170 years. Start your journey to Istanbul and stay in the heart of the old city minutes’ walk away from main attractions or you may wish to be as close to Bosphorus dividing two continents. 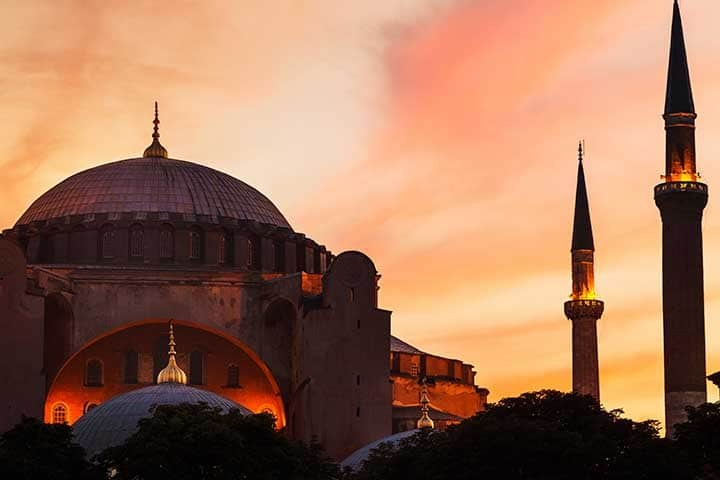 The flexible itinerary will allow you to enjoy own private guided touring with visits to ancient Hippodrome, Blue Mosque, Underground Cistern, St. Sophia, Topkapi Palace the old residence of Ottoman Sultans, where more than 20 Ottoman rulers lived for almost 400 years, with Treasury and Harem sections. Both Byzantine and Ottoman Heritages will be covered. Possibility to shop for textiles, jewelry, carpets, and antiques at the biggest shopping mall in the world Grand Bazaar also included. Lunch break will be organized according to your tastes and how your mood is during exciting visits. On return from Izmir Chora Church with magnificent mosaics and Spice market will be covered with an extension option subject to additional cost, 2 hours Private Bosphorus Cruise if requested. Sample the vibrant colors of the capital of three emperorships at night and enjoy Turkish Cuisine at its best at different neighborhoods. Following an hour domestic inland flight, Cappadocia will welcome you with its magical atmosphere and moonlike terrain filled with “Fairy Chimneys” and frescoed ancient churches, monasteries, cave dwellings, valleys to hike and underground cities. UNESCO World Heritage site Goreme Open Air Museum will be an easy but fascinating journey to the past. An early morning hot air balloon flight could be a highlight of your visit while giving you the opportunity to see this scenic land from bird’s eye and great photography opportunities. A stay in a cave suite will complement your entire experience a memory to remember for years to come. That’s what we call experiential. Next stop will be Kusadasi after almost an hour and a half inland flight to Izmir. 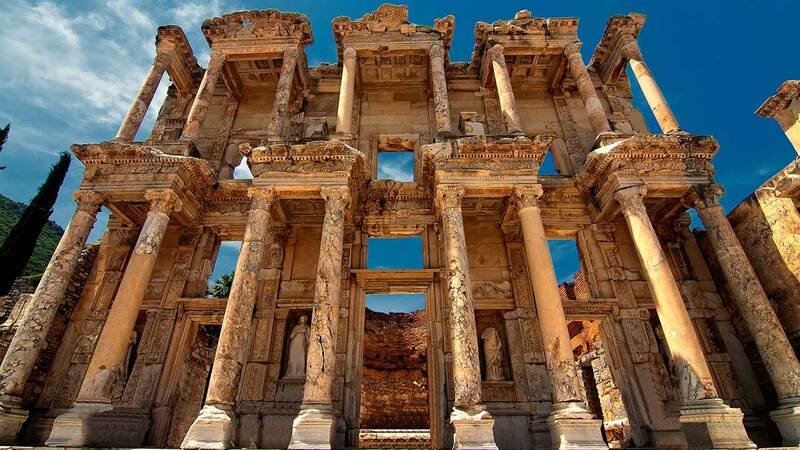 Your private guide will be ready all the way from the moment you land and give you all the insights of magnificent ruins of Ephesus with newly opened Terrace Houses of the nobles, Selcuk Museum to complete the picture perfect sites experience following a visit to sacred grounds of House of Virgin Mary. One of the 7 Wonders of the World remains of Artemission will be shown as well. Stay overnight in the most re-known boutique hotel of the region in a small but attractive village of Sirince, only 8 km’s to Ephesus and half an hour drive from Kusadasi. After leisurely breakfast, time to fly back to Istanbul for one more night. Half day flexible touring upon arrival to Istanbul complete Byzantine and Ottoman heritages covering adorable Chora Church and Spice Market. You can also enjoy other interesting sites like Dolmabahce Palace instead of Chora Church or walking around the interesting neighborhoods. An excellent addition can be a private Bosphorus cruise to enjoy the straight and see Imperial Ottoman palaces and water-front wooden mansions and see Asia and Europe at a time. Tonight you may also experience a treatment at a newly restored over 500 years old Turkish Bath (Hamam) close to your hotel in the old city. You will not be packing only your suitcases, but have great memories to take with and privately transferred to Istanbul Ataturk Airport to catch your flight back to sweet home. Full-day flexible private touring on arrival “Cappadocia Classic” with the open air museum, imagination Valley, Pasabag, Cavusin the abandoned village and sample ceramic arts demonstration from Hittite era. Day 4 - Early morning balloon flight at dawn and full-day flexible private touring “Wonders of Cappadocia” with Ihlara Valley, underground city, Saruhan Caravanserai on Silk Road from Seljukian era. Upon arrival, you will be welcomed at the airport and with a private minivan transferred to your hotel (Optional: Airport CIP Service assistance can be applied). After checking into the hotel, enjoy your time at leisure. Overnight in Istanbul. Our guide will meet you at the hotel at the desired time. 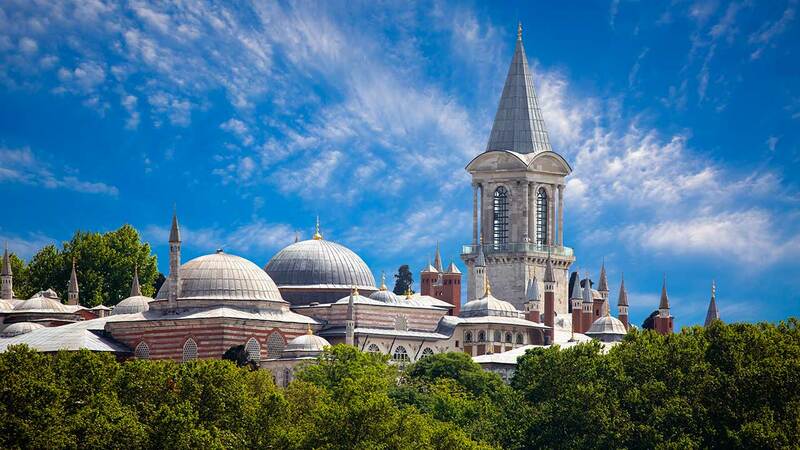 This tour would include with visits to Hippodrome the former center of sportive and political activities of Constantinople, Blue Mosque for famous for its blue Iznik tiles and unique six minarets and St. Sophia Museum the magnificent Byzantine Church of all times. Have lunch in one of the special traditional restaurants located in the old city. After lunch, visit Topkapi Palace the former imperial residence from where the Ottoman Sultans ruled their grand empire for over 400 years. Finish the day with a visit to the incredible Underground Cistern. Overnight in Istanbul. After checking out from the hotel, you will be privately transferred to the airport to catch your flight to Cappadocia. Upon arrival to Kayseri or Nevsehir Airport; you will be welcomed by your guide and start touring the area. First meeting with the lunar landscape of Cappadocia: rock formations beyond belief in Devrent Valley; walking in Zelve Open Air Museum: a journey in the past with its troglodyte houses; visit Pasabag “fairy chimneys” where the voice of wind mixes with the “songs of fairies”. Lunch in Avanos, the center of terra cotta work of art since 3000 BC. and a demonstration at a traditional pottery workshop. Afternoon, visit the famous Goreme Open Air Museum and see the best examples of Byzantine art in Cappadocia in rock-cut churches with frescoes and paintings (10th to 13th century). Visit Uchisar Rock-Castle to have a nice view of Cappadocia. Ps: Depending on the period of the season, Goreme Open Air Museum visit time can be altered to avoid crowds of tour buses. Dark Church is also included in this tour. After the tour, you will be transferred back to your hotel. Overnight in Cappadocia. Optional: Whirling Dervish Ceremony at a historical caravanserai from Seljuk era 1249, on the ancient Silk Road. Optional: Wine Tasting activity in one of Cappadocia’s panoramic Valleys with Cappadocia’s 6 different local wines, cheese & cracker plates. Early in the morning by dawn, you will be picked up from your hotel and transferred to the hot air ballooning base for a quick cup of coffee & tea and snacks. Then you will have a few minutes transfer to the take-off field. After pilot’s briefing, you are ready to explore Cappadocia’s stunning panorama with a bird’s eye. After an exceptional 1 hour flight you will be landing following a small celebration with local champagne, get your commemoration certificate and transferred back to your hotel to freshen up and breakfast. Preferably at around 10:00 am meet your private guide and start exploring the area further. Descend into the center of the earth in the Underground city of Derinkuyu or Kaymakli, the largest and the deepest of the 40 others in Cappadocia; walking in Ihlara Canyon, a “mirage” in the steppes of Anatolia up to Belisirma Village, the ancient Peristrema: “Valley of the Sky” along the Melendiz River. Rock-cut churches, spread across a wild plantation, surprise you with their successfully painted representations from the Bible. Lunch in Belisırma in a local restaurant by the river. Visit the Caravanserai of Agzikarahan, a very fine example of the Turkish Seljuk art, built in early 13th century on the legendary Silk Road for the accommodation of the traders and their camels. Back to the hotel and overnight at your Cave Hotel. Checking out from the hotel; you will be transferred to Kayseri airport to catch your flight to Izmir. Upon arrival, you will be welcomed at the airport and transferred to Selcuk. We will take off to the ancient city of Ephesus and first visit the Basilica of St. John, who came here with the Virgin Mary and wrote his Gospel. To the southwest of the Basilica stands the Isa Bey Mosque and further in the same direction is the Temple of Artemis, one of the Seven Wonders of the World. 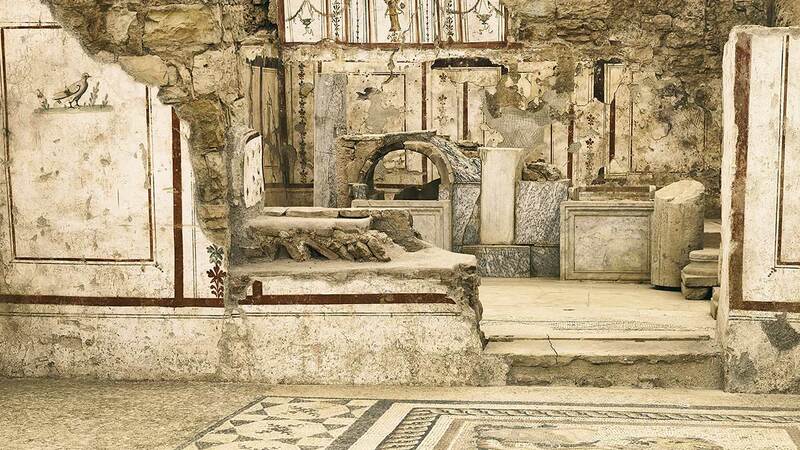 Visit Selcuk Museum where the finding of Ephesus lies before entering the ancient site. It was undoubtedly one of the most important cultural centers of the ancient world. 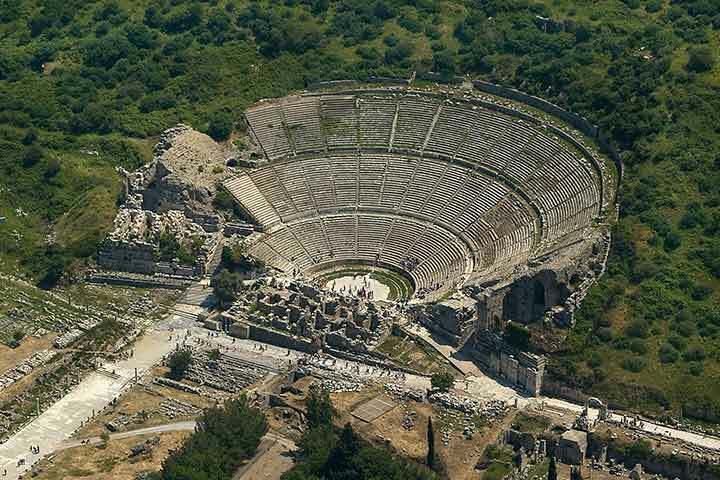 Impressive structures we will see include the Library of Celsus, Temple of Hadrian, Theater and Odeon. Terrace houses which opened to visit recently will be also included in our itinerary. Close by is the House of the Virgin Mary where she is believed to have spent her last years. On August 18th, 1961, Pope John XXIII proclaimed the House of Virgin Mary to be sacred. You will have a chance to take "A Phial of Holy Water" from the Sacred Spring. Overnight in Sirince a pretty beautiful and small village located at uphill outskirts of Selcuk. After a leisurely breakfast check out from the hotel, transfer to Izmir Airport to catch your flight to Istanbul. Upon arrival, meet your private guide and start touring. You will discover the beautiful mosaics of the church St. Savior in Chora which tell us all the life cycles of Virgin Mary and Jesus Christ. This church is known as one of the best examples of late middle age and pre-renaissance. Then we pay a visit to the Spice Market. In the past, Genoese and Venetian goods used to be sold at what is the second most famous bazaar after Grand Bazaar, Misir Carsisi or the Egyptian Market. Western travelers referred to it as the Spice Market because of the spice from Arabia, India, and the Far East brought here being loaded onto vessels in Egypt (there was no Suez Channel at the time). Alternatively, Dolmabahce Palace can be replaced Chora (Kariye) and you may opt to have a walk at the interesting neighborhoods. After the visit, additional 2 Hours Bosphorus Cruising** option is a great way of ending your vacation. Breakfast and check-out from your hotel you will have a private transfer to the Ataturk Airport according to your flight time to catch your flight back home. 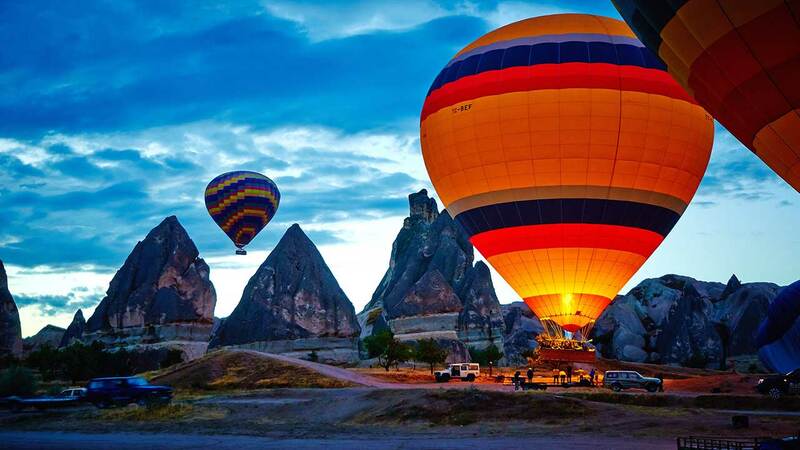 Optional: upgrade 95 Euro per person, Hot Air Balloon Flight in Cappadocia for an hour up to 20 passengers in the basket included in the program and can be upgraded to a Deluxe flight 1,5 hours up to 12 passengers in the basket. Private flight bookings upon request. Optional: you may want to enjoy and learn more about Cappadocia's landscape and red & white drops by adding a present a private Wine Tasting activity after their tour at a valley with great views. You will get information about different types of wine in Turkey and Cappadocia birthplace of winemaking. Rate: 100 Euros per person for the event/to be booked in advance. Optional: you may wish to experience a Whirling Dervishes Sema Ceremony in Cappadocia. We provide this at a unique 12th century Seljuk Caravanserai on Silk Road. Ticket price is 25 Euro per person and a private return transfer of 65 Euros up to 4 guests and 75 Euro up to 12 guests to be added. Optional: for private 2 hours private Bosphorus Cruise option on the last day with a motor yacht, a supplement of 175 Euro per person to be added based on 2 guests. More joining guests will be recalculated. This activity is our best seller! According to arrival and departure international flights, museum opening days or availability of direct flights between Cappadocia – Izmir itinerary can be reversed to makes your time in Turkey most efficient. Our guides may alter the program according to busy periods of the museums keeping the same program. While if there is a room at a hotel; we get priority of the bookings. However, during some periods, hotels may be fully booked or if you are traveling as a group; they may not have enough rooms. We will make sure you will be offered the same or similar category hotel option(s). If you want; we can book only suites at hotels desired. Guiding at all locations will be provided with best guides of the region. If you want one guide to accompany throughout the whole program; then guide's travel expenses will be added to the total itinerary cost.